The peanut butter filling is simple to make with just four ingredients: butter, confectioners' sugar, peanut butter, and salt. A standing mixer fitted with a paddle attachment will make quick work of mixing the ingredients together. The finished mixture should clump into a non-sticky dough and hold its shape when squeezed in your palm. I used this inexpensive egg mold to form the shape (a leftover from this project 4 years ago! ), but the dough is so pliable and formable that you could probably shape it into an egg using your hands. If you use the egg mold, press the peanut butter mixture tightly into the ungreased cavity until it mounds over the top edges. Trim away the excess peanut butter filling using a large chef's knife. The natural oils from the peanut butter make it possible to immediately turn the egg out without any sticking. 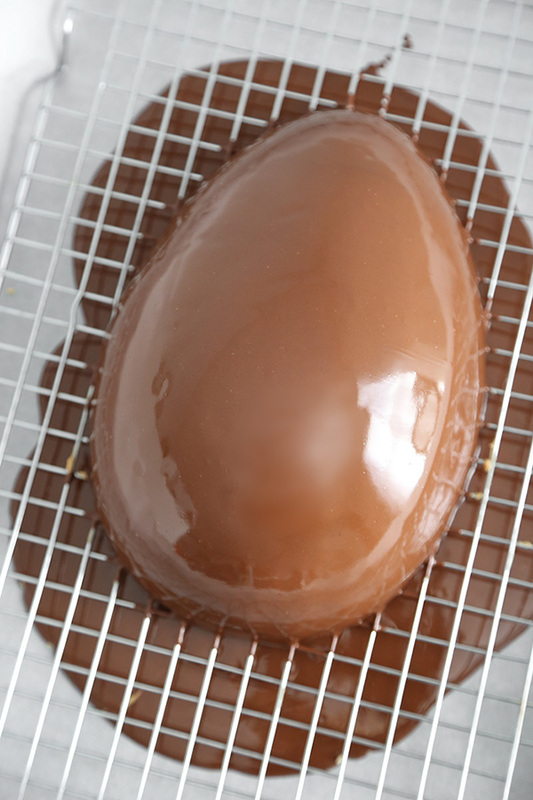 If you have trouble getting the egg out of the mold, refrigerate it until firm enough to press out. You'll have a few cracks in the molded peanut butter filling, and these can be 'spackled' with a little peanut butter. Just drop a spoonful of peanut butter on the egg and smudge it into the cracks with your fingers. You can also use a kitchen-dedicated soft bristle art brush to do this. The chocolate coating is a mixture of semisweet chips and vegetable shortening (coconut oil can also be used). The shortening thins the melted chocolate so it's easy to pour and achieve an even covering. 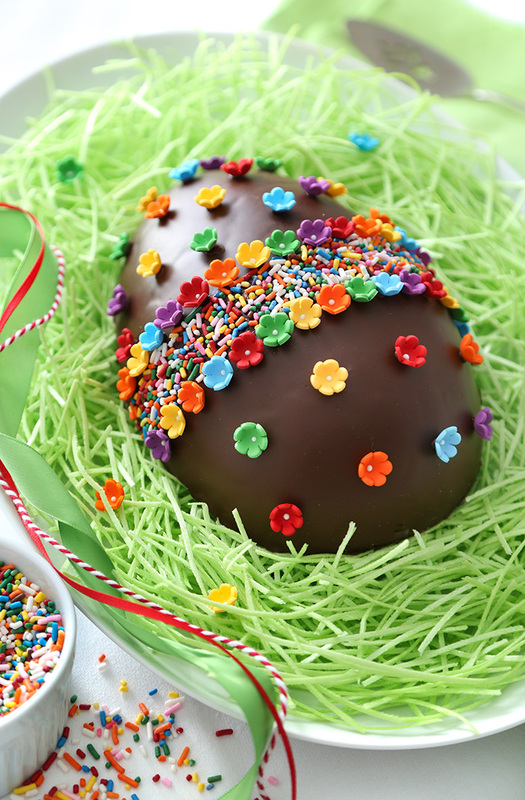 Chill the covered egg until the chocolate is set and loses its shine. Now you can decorate it! I painted a band of piping gel around the center of the egg and tossed on some rainbow sprinkles. If the band looks uneven, use a toothpick to scoot the sprinkles into an even line. I had some ready-made rainbow royal icing flowers from Wilton, and boy, did that make decorating easy! I like how they match the rainbow sprinkles. I attached each flower with a little dot of melted chocolate. I chose to display the egg on a bed of weird and wonderful green apple edible Easter grass. OK - so, maybe it's more weird than wonderful, but I think it's better than picking plastic grass off of the egg before eating it. I had some filling left over, so I used it to make 6 standard-size peanut butter cups. Sharing this with others is the real treat! It's definitely a confection that draws an audience for the first slice, with lots of ooohs and aaaahs to follow - especially from the kiddos! Use shelf-stable peanut butter such as Jif for this recipe. In the bowl of an electric mixer fitted with the paddle attachment, add the confectioners’ sugar, 3 cups peanut butter, salt, and butter. Beat on medium speed until combined and the mixture becomes crumbly. Add cream one tablespoon at a time and mix until a thick, soft dough forms. You’ll know it’s the right consistency when the mixture holds together when you squeeze some in your hand. It should not be sticky. 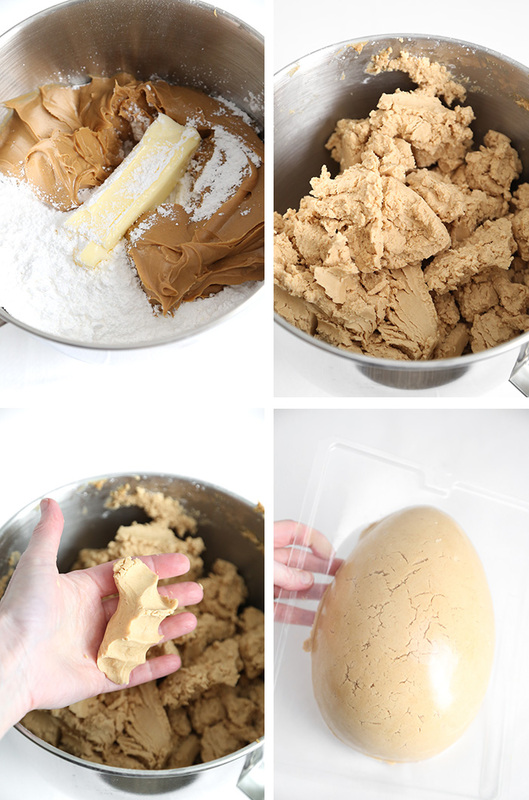 Thoroughly pack an 8" x 5.5" x 3" confectioner's egg mold with peanut butter filling mixture. Trim any excess off the back of the egg with a large chef’s knife until the filling is even with the surface of the mold. Line a baking sheet with parchment or wax paper and set a grid cooling rack on top. 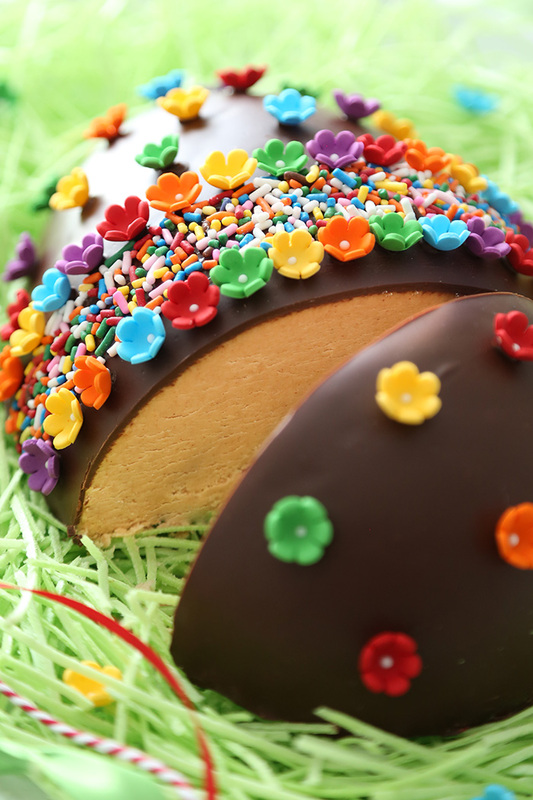 Carefully turn the peanut butter egg out onto the cooling rack with the flat side down. Use the extra tablespoon of peanut butter to fill in any cracks that developed on the egg’s surface. Use your finger to smudge the peanut butter into the cracks evenly. On a stove top over medium-low heat, melt the chocolate chips and shortening in a saucepan, stirring occasionally. When chips and shortening are melted and smooth, transfer the mixture to a cup with a pour spout. 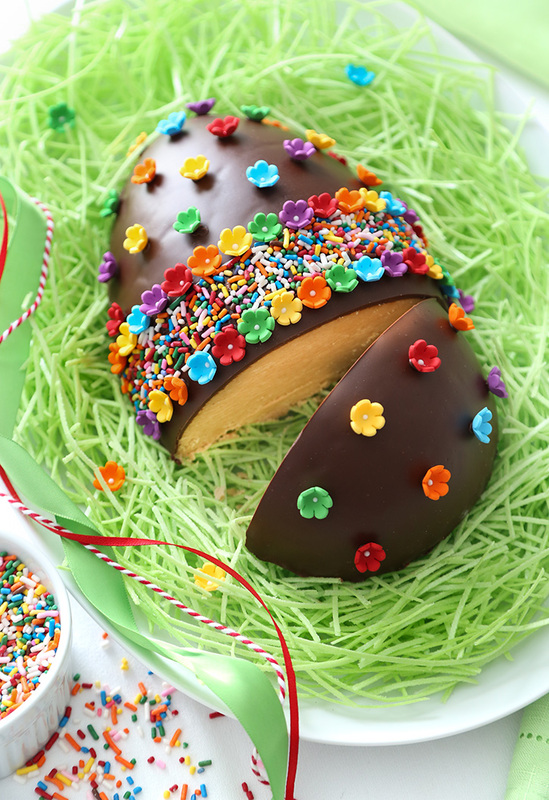 Pour the chocolate over the surface of the peanut butter egg, until the entire top surface is evenly coated. Let stand 2-3 minutes and then pour another coating of chocolate over the first layer. Set aside to cool at room temperature. Refrigerate at least one hour or up to overnight before decorating. 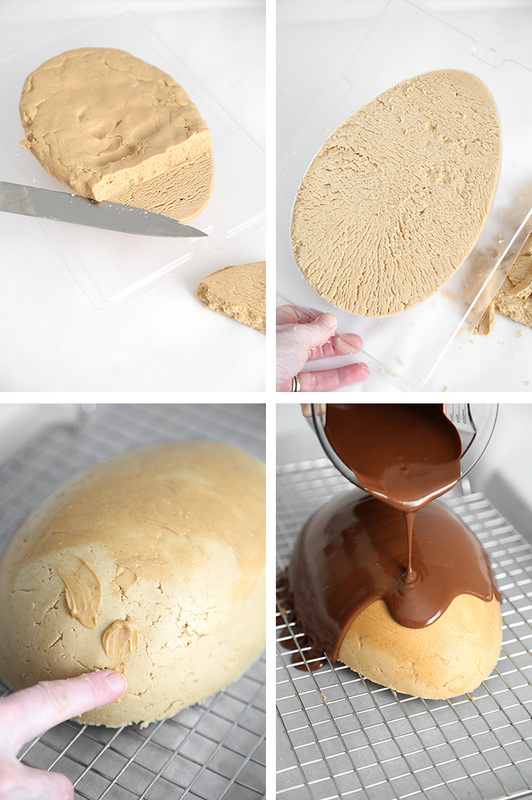 Remove the chilled coated egg from the cooling rack by using a large chef's knife under it to slice and pry loose the peanut butter and chocolate, then lift off with one hand and a spatula, and set on a serving plate. 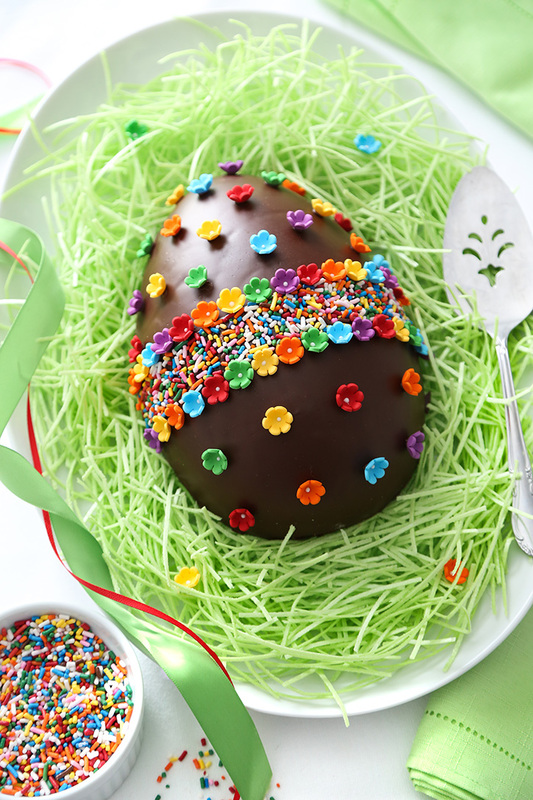 To decorate, brush a band of piping gel onto the middle of the egg and pour on sprinkles. Attach flowers on either side of the band with dots of melted chocolate. Arrange more of the flowers on the egg as desired. Extra peanut butter filling can be used to peanut butter cups. You’ll need 1 additional cup of melted chocolate. To make peanut butter cups, set foil cupcake liners in the compartments of 6 cavities of a standard cupcake pan. Brush insides of cupcake liners with melted chocolate; let cool for one hour or refrigerate until set. Press peanut butter mixture into each cup until filled within 1/4 inch of the top. 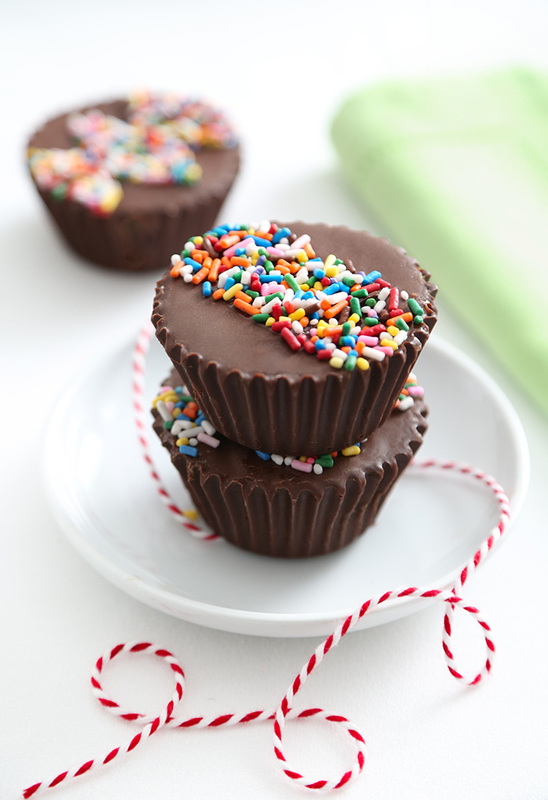 Pour melted chocolate into each cup until filled and smooth evenly. Refrigerate at least one hour before decorating. 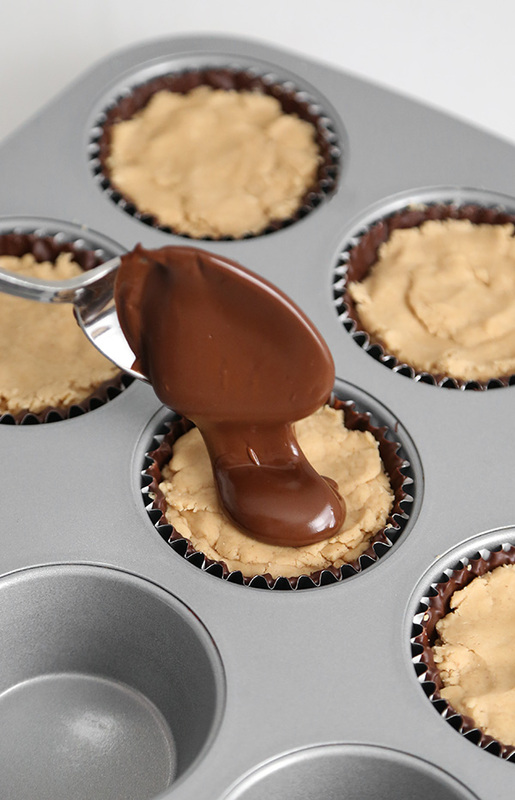 Turn peanut butter cups out of the muffin pan and brush with piping gel. 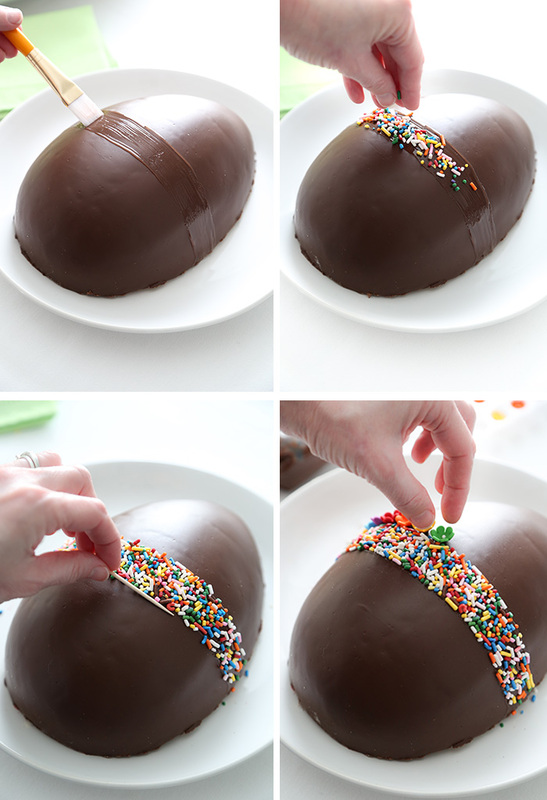 Pour on sprinkles to decorate. How would you store this egg when it is completed because you are using cream? Woukd i be able to use sweetened condensed milk instead? Refrigerate. However, if you want it to store it at room temperature you can simply add tablespoons of water instead of cream. GROßARTIG vielen dank, sieht traumhaft aus! And, it's gluten-free which is much appreciated since I struggle to bake treats for my nephew who can't have wheat things. How many people would this serve? It seems like a big egg in the pictures, but the measurements given in the recipe seem small. I want to make it for my son's class, and there are 18 kids. Thanks! The measurements may seem small, but it makes quite a large egg that weighs about 2 pounds. It is very rich and dense, so I believe it would easily serve 18 children. Thanks for asking! Heather- the egg was a huge hit at school and so rich and delicious! I made the 6 extra peanut butter cups and kept them selfishly at home. The mini icing flowers were very easy to attach w a dot of chocolate and made it seem like I am good at decorating things (I'm not :) Thanks for this recipe!